When we last left off, over a year and a half ago, Corporate America had just begun hitting store shelves, and I was just beginning to get a grasp on its financial situation. Even though the Kickstarter was successful, I had to spend a pretty penny to finish and release the game. So, what’s changed in the 19 months since I posted that article? Corporate America sold out! Given that there were about 1350 games to be sold, that’s a huge accomplishment! The game may not have been a blockbuster, but that’s not what I shoot for. I’m more interested in cult classics. As one game store owner told me, Corporate America is a bit of a sleeper hit, and I’m thrilled about that! …and that’s about it for good news. 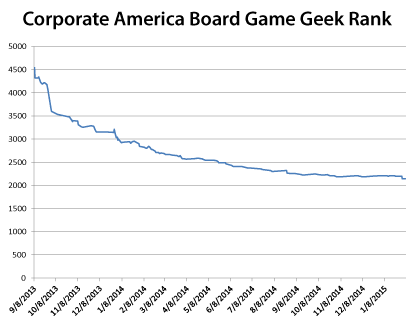 But since that’s so short and I like sharing information, here’s the slow but steady rank progression of Corporate America over at Board Game Geek. Keep in mind that lower is better here, so the general decline is a good thing! After an initial drop from 4500 to 3000, the game has slowly been approaching 2000. I don’t expect the game to ever reach triple digits, but I do hope it manages to go below 2000 some day. If you’d like to help, you can rate it on Board Game Geek! Corporate America has been played around the world, and many of those who have discovered it have loved it. But that doesn’t necessarily translate to financial success. When the game finally released, it had almost $10,000 to earn before breaking even. So now that all of the games are sold, how much money has Corporate America actually made? As you can see, total profit from Corporate America was $9,780.31. Given that it took a very long time to make and sell this game, that’s not a lot. For those counting, I made about $24.54 per game before costs. After costs, that’s about $6 profit on each game. The game retails for $40. 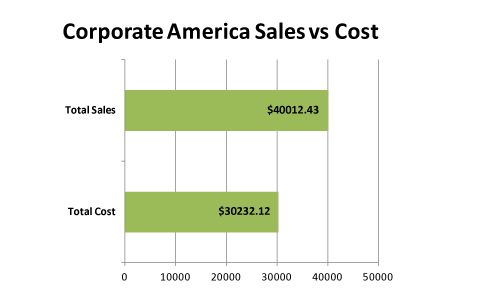 This isn’t quite the whole picture, because some copies of Corporate America were sold through the Shadow Throne Kickstarter, and the money from those games went toward producing Shadow Throne rather than to the above total. On the other hand, I haven’t included any additional costs in the above number, even though there have been some since the Kickstarter. Aside from the basic costs of operating a business and website, I have spent plenty of money to attend conventions and other events to promote Corporate America. At the end of the day, while I think Corporate America has been a big success, it hasn’t provided close to enough to support a business… or me. Is it possible to make a sustainable business around self-publishing quality tabletop games? I sure hope so! Since Corporate America, I Kickstarted Shadow Throne, which should be in stores by next month, and I’m planning on Kickstarting a third game, Birds of a Feather, in March. If this business model is fundamentally flawed, I’m in trouble. Instead of giving up, trying to learn from my experience with Corporate America. Below are some of those lessons. The Price is Wrong. I’ve already discussed that I should have priced Corporate America at $50, not $40. Assuming it wouldn’t have deterred customers (I don’t think it would have substantially), that would have brought me an extra $5 or so per copy. That doesn’t sound like a lot, but when you’re selling 1,000 or more, that adds up quickly. Check your Scope. Make your first game small. I thought Corporate America was a trim game, but it was much too big for my first one. One of the reasons I under-priced Corporate America is because for a first time designer and publisher, $50 is asking a lot. And one of the reasons I ended up paying so much after a successful Kickstarter is that the game required way too much money to produce. If I had gone with a simple card game, I wouldn’t have been fighting a losing battle from the very beginning. One isn’t Enough. Sure, if your first game is the next Cards Against Humanity, you’re probably set for years. But for most people, that isn’t realistic. A publisher needs multiple games on the market to be sustainable. Not only does that provide multiple income streams, and therefore some security, your games will help sell each other. Infrastructure. One game lays the groundwork to help produce and sell the next one. From prototyping skills, to knowing playtesters, to connections in the industry, to reputation and fan base, up-front costs will become shared across your catalog, making each game cost less. Economies of Scale. When you’re making your first game, it’s probably best to make as few copies as you can. The ceiling for earnings is lower, but you risk much less if the game doesn’t sell well. 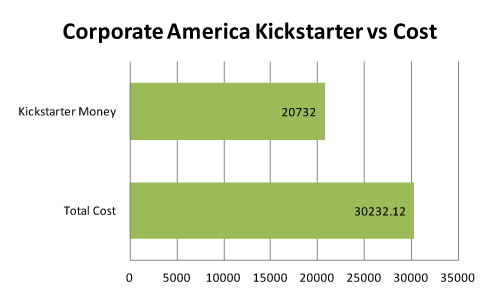 Given the rough Kickstarter, it made sense to make as few copies of Corporate America as possible. But moving forward, I’m hoping I’ll be able to do larger print runs. It’s too early to know for sure, but I think I should have ordered more copies of Shadow Throne. And for Birds of a Feather, I’m going to increase the print run with each stretch goal. Not only does producing more games let you sell more games, it also lets you take advantage of economies of scale, netting more profit for each sale. Reduce Shipping. This one’s a little speculative, but shipping is really expensive. Shadow Throne was planned a little better than Corporate America, because the box size was determined based on shipping considerations, but in the long term I’m interested in exploring American printers. Chinese manufacturers may be cheaper, but freight shipping is expensive (~$2000) and often involves working with an extra middle man. American companies usually require a much larger print run, but if you’re shooting for a large print run anyway, that’s not an obstacle. For this year, I’m not going to experiment with anything too crazy, but I will definitely be exploring my options moving into 2016. Silver Lining. Maybe it’s time to face facts… there just isn’t that much money in board games. While I am optimistic that Nothing Sacred Games can be sustainable, I don’t think I’ll ever be rolling in cash. And I’m honestly kind of happy about that. I’ve been involved in the video game industry for years, where games can make millions of dollars, and it ruins the community. Going to the Game Developer Conference, you see more people excited about making money from games than you do from making games, and that’s just sad. I know that in our culture not maximizing profits is considered a mental illness, but if I can sacrifice a bit of income to maintain the enthusiasm and integrity of the tabletop community, call me crazy. I’m sitting here talking about Corporate America as if it’s a done deal, when in fact it’s not! The game continues to give, even after selling out. PNP FTW. Even though there are no more physical copies of Corporate America, the print & play is still for sale in the Nothing Sacred Shop. It’s not a huge seller, but every sale helps. Patent Trolling. Corporate America doesn’t have a terribly strong brand, but it is reasonably well known by gamers at this point, and Nothing Sacred Games still owns all those hilarious business names. In other words, I can still use the intellectual property from the game for other projects. And in fact, I’m working on a deck builder about tech companies that lets players run one of the technology businesses from Corporate America. Back from the Dead. I’m not talking about zombie corporations here (everyone knows corporations are too big to fail in the first place). No, I’m talking about reprinting Corporate America, a question that comes up whenever I mention that the game has sold out. The short answer is I don’t know if there will be a reprint of Corporate America. It’s a complicated question. While it’s clear there is more demand for the game, it’s not clear if there’s enough demand to justify a whole additional print run. And then there’s the question of how I would pay for it–the first Kickstarter still brings back memories of mental anguish. I’m better prepared now, but I’ve also learned to scale back my projects. Plus, I would want to address some problems the original game had, and I’m not sure how that would impact the cost of reprinting. So while I’m keeping the possibility of a reprint in mind, I encourage readers to not hold their breath. This year, I’m focusing on releasing Shadow Throne (almost there! 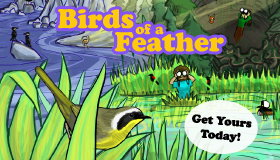 ), fundraising for Birds of a Feather and Shifting Shadows, and preparing for an awesome 2016. Whether Corporate America makes a reappearance then is still up in the air. Three years ago, I left school to pursue my dream of becoming an indie game designer, and Corporate America was my first big project. I’m proud to say it has not only kept me afloat after diving head first into unknown waters, it has taught me so much that school never could. I would like to thank my generous Patreons for providing support and encouragement for this article. In your take aways section you forget to mention “Add Exploding Kittens”. I hear that can boost pre-order sales by about $5,000,000. Based on my market research, bird watching and exploding kittens should have exactly the same effect in a Kickstarter. We’ll see if I’m correct! Excellent article. All this insight to the game production process is very helpful to me as a consumer. Thanks for the enlightenment!